Live from the Korean Overwatch Fan Festival, we got a few great new announcements. Ben Dai, one of their project directors, began by teasing the crowd a little, saying if they’re in Korea there’s only one character they could choose for the short we’ve all been waiting for. D.Va got her own cinematic, called Shooting Star. Before we start talking spoilers, you might want to watch the short for yourself. The scene opens with D.Va talking to a friend of hers, both working on various mechanical tune-ups around the hangar. Her friend grabs a soda, which is branded with D.Va all over the can, and rings out in a chirpy greeting in her voice when he opens it. They have a short discussion about the ongoing battle against the omnics, which they seem to be winning — for now. All of a sudden, the scanner pings with an incoming attack. D.Va decides to hop into MEKA immediately to stop the attack. Her friend cautions her to wait for backup, but every time D.Va reassures him. Several times through the short, D.Va is cautioned to wait, to let someone help her. It’s only when MEKA is seriously damaged that D.Va finally allows her friend to help her remotely. While MEKA is tangled in the omnic’s tentacle arms, her friend overloads the reactor core, allowing D.Va to press Q and bail from her mech. She falls into the sea as the whole thing explodes. D.Va is injured, but she makes it through with help from her friend, praise from the grateful nation she saved, and some disgusting snacks. Blizzard confirms fan canon: D.Va is a Dorito gremlin. 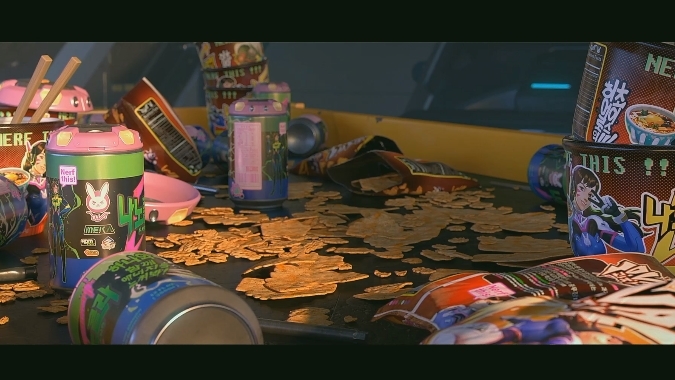 Of course, most of her junk food is branded with her face, tying it in to the beginning of the short. Though this is a fun vignette and a bit of insight into D.Va’s character, I was a little disappointed it wasn’t more emotionally wrenching in the way the others were. I thought the story of a conscripted child soldier used for propaganda would be a bit darker. I know that maybe sounds a little sick on my part, but it seemed as though much of the part where a lot of the friends she knew probably died in omnic attacks defending the country was sort of glossed over. I understand that isn’t the story they wanted to tell, and Blizzard isn’t a genie granting my own personal cinematic wish, but considering we got insight into Bastion’s wartime ghosts it doesn’t seem out of line to expect a young human would also have psychological demons to fight along with omnics. Other than my personal quibble this cinematic, like the others, was absolutely perfect. The animation itself was top-notch, and it was voice acted perfectly by Charlet Chung. 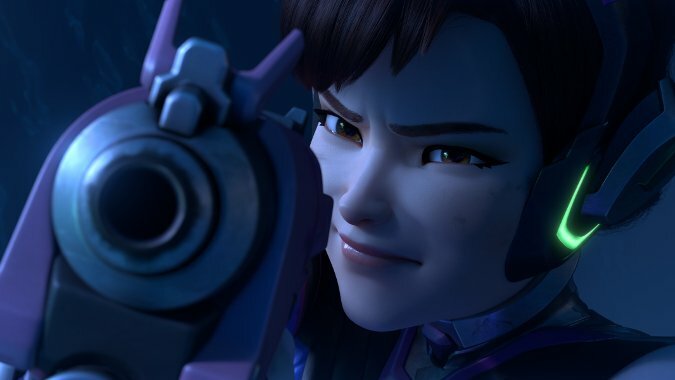 There were a ton of frames throughout the short that could be works of art in their own right, with great image composition and interesting depth of field, like when D.Va decides to get out of MEKA. Her face isn’t in focus in that moment; her bunny blaster is.